If any insect deserves the moniker of terminator, it would definitely be the praying mantis. A quick glance at praying mantis and its over-sized “hands” and jaw, tells you that the praying mantis was honed by evolution to dismantle and devour other insects. One unique feature that clues you in further on their predatory design is their singular ability among insects to move their head side to side at 180-degree angle. Our best current estimate is that they are also capable of detecting the slightest movement within a 60 feet range, which is quite impressive. Therefore, for human purposes, praying mantises can serve as top of the line natural (organic) pest control. They will attack almost any insect in vicinity – mites, pest insects, and pest eggs. Any insect problem your garden has, praying mantises will deal with quickly and efficiently. Surprisingly, they might even attack an occasional lizard, mouse, and even a hummingbird. Still, if you want to avoid the use of harmful pesticides (which decimated honey bee populations), a small praying mantis army in your garden will perform admirably. How to Find Praying Mantises? You don’t actually want to find and transplant individual praying mantises to your garden. That would be unreasonably inefficient exercise and a waste of time. Instead, you need to seek out their light brownish egg cases. Females will lay their eggs in the Fall all over tree, bush, and plant stems, regularly above ground, so they can’t become an easy prey. Incidentally, the best way to attract praying mantises to come to your garden on their own is to have lots of shrubbery, preferably a dense patch that can provide lots of cover. If there are any around, the females will seek such perfect spots for their offspring. Sharp clippers suitable for shearing off tough blackberry stems. A plastic bag or box for storing and carrying the egg cases. The egg cases blend quite well with the environment, so you will want to venture for this egg hunt in a bright, sunny day. Look higher up the stems for brownish-yellow blobs that seem out of place. Those are your praying mantis egg cases, and a single one will yield 100-200 praying mantids, hatched all at once. Both their smaller and adult form are great for pest control, as the smaller ones will attack the smaller pests, while the adult praying mantids will attack the larger insect threats to your garden. If you are not up to for a praying mantis egg scavenging, you can always opt to order them online. Yes, you can even order that peculiar item online, and quite cheaply at that. Usually, 5 egg cases would cost you well under $30, and they will include miscellaneous items like cup habitats, strings, and even an extra batches of ladybugs. So overall, it might be worth it to tread the more convenient online route instead. How Many Egg Cases Should You Collect? You don’t won’t to overdo it in unleashing praying mantids on your garden, as they will attack other praying mantises as well when they are finished with the pests. In short, it depends entirely on the size of your garden, no more than 8 egg cases per half an acre, so adjust accordingly. When and Where to Place the Eggs? Once you have gathered your collection of praying mantis eggs, appropriate for the size of your garden, the best time to release them into your garden is around mid to late spring. Attaching the egg cases to the new stems will be trickier than the collection, as you will need thin strings in order to attach them on the upper end of their new homes. Or you can simply wind the old stems to which the egg cases are still attached, to the new stems. The height should be at least three feet from the ground, so they can’t be easily devoured by mice and other protein-seeking creatures. Therefore, it would be a good idea during the egg collection to cut the stems a bit lower, so you have an extra length to work with afterwards when you plant the egg cases. When they hatch they should be provided with sufficient nutritional support, so choose a spot that will bloom densely during the springtime growth spurt. Make sure to spread the egg cases apart! You don’t want for them to eat each other before they clean out your garden from pests. If your garden holds enough plant variety and shrubbery, it will likely be more than enough to establish a self-sustaining mantis colony, so you will no longer have to worry about getting more mantis eggs next year. Praying Mantises don’t just have to safeguard your garden, they can also become your pets, although of the aloof kind. Once they have hatched from their egg cases, you will have ample opportunities to catch adult specimens, and as their preferred way of hunting is ambush by perching on plants and catching anything in sight, you will have no difficulty in spotting them. 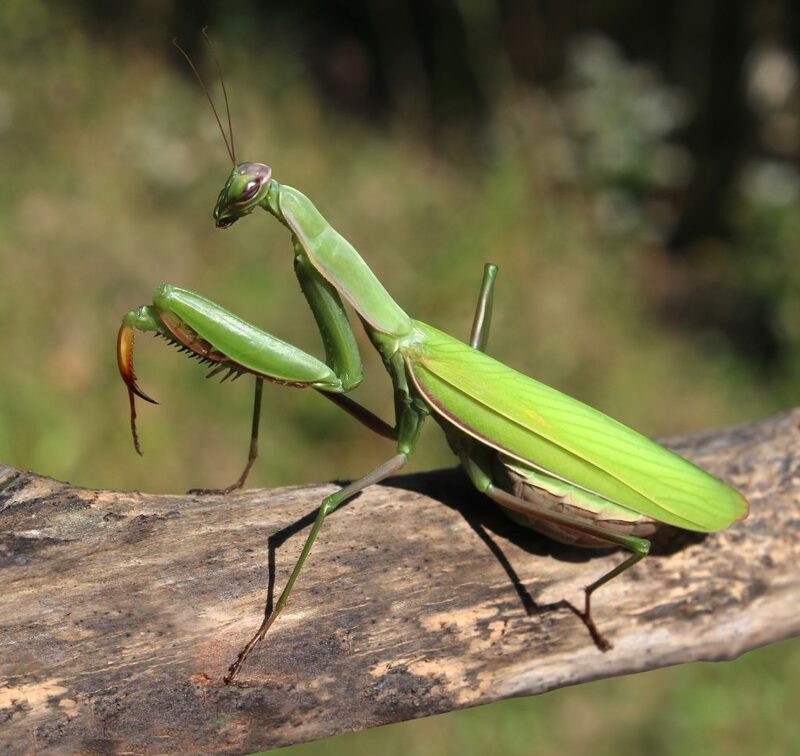 You already know that they will eat pretty much everything, including other mantises, however, adult mantis will have trouble eating very small insects, and most won’t eat dead ones. Fortunately, they will jump on a struggling insect at the end of your tweezers. Also, don’t forget about the water requirement; a wet sponge will be sufficient for the task. Overall, it’s always fun watching praying mantis attack and kill all sorts of insects, especially the larger ones like grasshoppers. Just imagine the Youtube views, and Instagram/Imgur likes!